Do you still read latest news on dead paper? Do you still watch TV for your latest news? If so, I can tell you who you are and how old you are. A new report from Reuters institute for the study of Journalism at the Universe of Oxford, claims that there is a generation divide when it comes to news consumption. The research is based on a survey of more than 50,000 online news users in 26 countries around the world and it is the largest ongoing study of its kind. Author Nic Newman said “We really hit a landmark this year”, and for the first time, more than half of the DNR sample now uses social media for news each week, and the growth has been enormous since 2013. No one is near the social media king Facebook with 44%. Next is YouTube (19%), although the video network plays a prominent news role in some countries. The report also claims that video news is growing more slowly than expected. Twitter is third with “only” 10%. 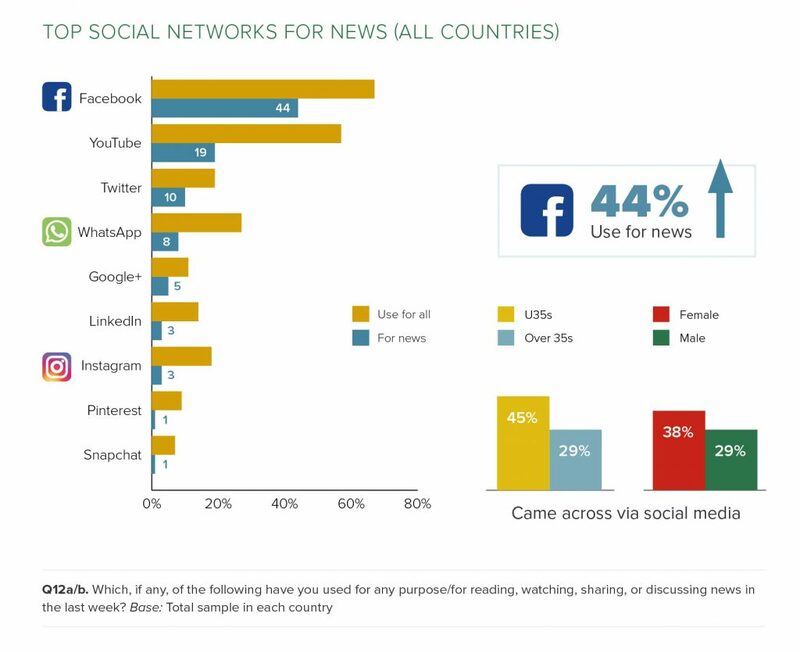 The report explores news consumption in : the US, UK, Germany, France, Italy, Spain, Portugal, Ireland, Norway, Sweden, Finland, Denmark, Belgium, Netherlands, Switzerland, Austria, Hungary, Czech Republic, Poland, Greece, Turkey, South Korea, Japan, Australia, Canada and Brazil. Digital-born companies like BuzzFeed and The Huffinton Post are growing and The Huffington Post is the second most-consumed online news source in the U.S and the third popular in the U.K. But do people trust the news? In the Unites States, news media is trusted by a third (33%) of users, but its worse in Greece with its lowest at 20%. Finland are at the top with 65%. It remains to see good quality Journalism and people’s willingness to pay for it.